Aerial view of TopFlight Grain Co.’s rail terminal at Milmine, IL, with newest steel annex section at lower left. Aerial photo by Steve Huey, Pekin, IL. Tiny Milmine, IL, a collection of not much more than a dozen houses about 25 miles east of Decatur, IL, is so small that it doesn’t even show up on some Illinois road maps. TopFlight Grain Co.’s latest addition to its grain elevator there, however, may be enough to make it a destination of choice, at least for producers in much of central Illinois. “We did a survey of the volumes at all of our 15 grain locations,” says General Manager Scott Docherty. “We looked at where we were short on space and at places where we could build without being landlocked by in-town locations. In addition, he says, the Milmine elevator was located along a Norfolk Southern main line, with enough space to build extra siding track to handle trains up to 75 cars, for shipping grain to the big processors in Decatur or to the southeastern feed markets. In 2011, TopFlight built a large steel annex at Milmine consisting of about 850,000 bushels of upright storage, two receiving pits, four legs, a 40,000-bph bulk weigh loadout system, two gravity screeners, and a 5,000-bph grain dryer. After taking bids on the huge project, the cooperative selected GROWMARK Grain Systems, Bloomington, IL (309-557-6000), as general contractor. Groundbreaking took place in September 2010, with the project finishing up in September 2011 for a confidential cost. Springfield Electric Supply Co., Springfield, IL (217-788-2100), supplied electrical systems for the project. VAA LLC, Plymouth, MN (763-559-9100), performed engineering work. Mulford Concrete Inc., Hampton, IA (641-456-5200), supplied 4,000 yards of concrete and poured it on-site. Stokes Excavating, Shirley, IL (309-275-9400), did site excavation and road building. Ameritrack Railroad Contractors Inc., Frankfort, IN (765-659-2111), performed rail construction. TCR Systems, Decatur, IL (217- 877-5622), served as millwright. GROWMARK brought in Cross Country Consruction, Elbow Lake, MN (218-685-6410), to erect two new GSI corrugated steel tanks. The larger of the two, intended for dry grain storage, stands 90 feet in diameter, 88 feet tall at the eaves, and 113 feet tall at the peak, holding 515,000 bushels. The smaller tank, intended as a wet bin, holds 315,000 bushels standing 72 feet in diameter, 85-1/2 feet tall at the eaves, and 105 feet tall at the peak. These flat bottom tanks have outside stiffeners, 16-inch Sudenga sweep augers, and 4B BinBob level indicators. For now, there is no grain temperature monitoring system, but it can be installed later. A set of four 30-hp Caldwell centrifugal fans on the dry tank provide an estimated 1/10 cfm per bushel of aeration to the dry tank through infloor ducting, while two 40-hp GSI centrifugal fans provide an estimated 1/7 cfm per bushel of aeration. In addition, the project included construction of 6,000-bushel and 10,000-bushel overhead hopper tanks for storage of fines and a 4,000-bushel overhead hopper tank for loading trucks, as well as a 30-foot diameter, 30,900-bushel hopper tank for holding off-grade grains. On the south side of the annex, GROWMARK installed a pair of 1,000-bushel enclosed mechanical receiving pits. Through a series of valves, these pits can send three of four new GSI legs – a 20,000-bph receiving leg, a 20,000-bph dryer wet leg, and a 20,000-bph dry leg, both of which can double as receiving legs. The fourth leg is the rail shipping leg rated at 40,000 bph.) The 20,000-bph legs are outfitted with 20×8 Maxi-Lift heavy-duty low-profile buckets mounted on 22-inch (brand name) belts. The 40,000-bph leg has two rows of buckets on a 44-inch belt. The receiving and dryer legs empty grain into a Union Iron Works eighthole rotary double distributor. The operator has the option of routing grain through a 20,000-bph Intersystems gravity screener below the distributor. From there, grain runs out an overhead 40,000-bph GSI belt conveyors to the wet tank or via either of two 20,000-bph drag conveyors to the dry tank. The wet tank empties onto an aboveground 20,000-bph GSI drag conveyor running to the wet leg. This leg, in turn, feeds into a natural-gas fired Zimmerman 5,000-bph tower dryer. Clements notes that TopFlight operates Zimmerman dryers at most of its locations and likes their performance. 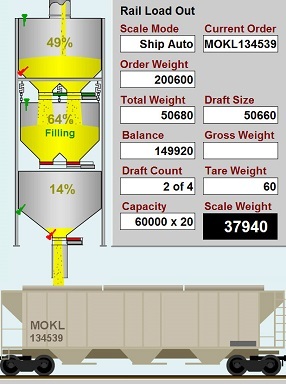 The shipping leg delivers grain to a 40,000-bph Intersystems screener, which in turn, deposits it into a CompuWeigh 40,000-bph bulk weigh loadout scale equipped with a Gamet sampler. Loadout operations are under the control of CompuWeigh’s GMS-4000 Grain Management System, which includes the optional SmartRead railcar RF tag reader, as well as SmartLoad and Super SmartLoad, which allow the bulkweigher to run, while the next car is brought into position by preloading the weigh hopper and lower garner. Workers atop railcars are protected by a four-railcar-length Fall Protection Systems trolley unit.